Yes, if you believe human beings are whole, integrated systems. By “integrated systems” we mean that if something impacts one part of the system it affects the whole. So feelings affect the body, there is a mind/body connection. The head and the heart have a connection, and even the brain is being constantly formed and influenced by our thinking. Historically, science was seen as very separate from psychology and scientists, in general, liked it that way! Psychology was viewed as the poor relative, a “soft” science without the same rigor “pure” science had. The lack of hard data, with respect to results sealed it’s fate. Spirituality was also seen as a separate matter altogether… clearly different from science and psychology and set off in a place of its own. Religion and religious studies was the domain for spirituality and, again, conscious effort was made to keep it separate and distinct. The answer to this lies in what Prime Potential is really all about. Is Prime Potential about the mind – how we think, plan and behave in order to get what we want? Is Prime Potential about the body and helping it recover, repair and heal? Or is Prime Potential about the spirit—the essence of a person—and how fulfilled they feel? The answer is yes to all three. 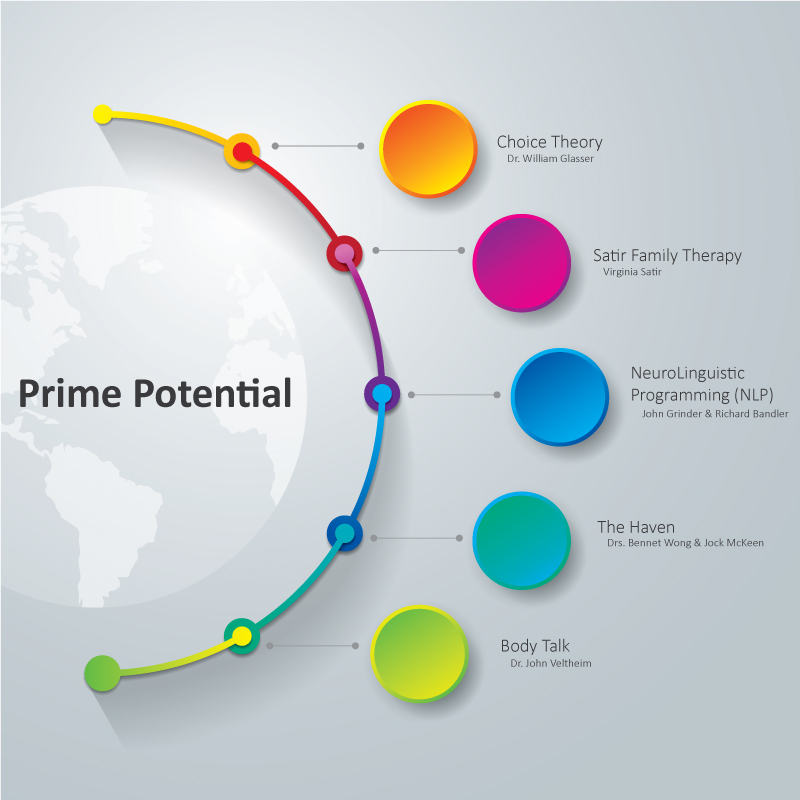 In Prime Potential we draw on a rich history of pioneers in the field of Psychology. Dr. William Glasser developed a theory of human behavior, and illuminated our understanding of human beings as “control systems”,internally motivated to meet our psychological needs (Choice Theory). Richard Bandler and John Grinder brought us a profound understanding of the mind (Neuro Linguistic Programing NLP) which had never before been identified in such a clear concise way. What they offered opened the door to radical new ways to deal with trauma and fear, as well as ways to replicate highly successful strategies of people like Walt Disney. Virginia Satir, family therapist, recognized the dynamics of systems, specifically the family and how they influence a person’s development. She identified the origins of deeply held patterns and beliefs that limit people.